A development company of one, the story of SPQR Soft is actually the story of Steve Radabaugh, a freelance app developer, technical consultant and game designer as well as teacher of Computer Science. Founding SPQR Soft in 2012 in order to explore the possibilities of crossing tabletop gaming with the recent boom in app development, he’s gone on to release multiple playing aids for various role playing systems and enter to forum of card based RPGs with his game Dungeon Marauders. First and foremost, thanks for taking the time to speak with us here at My Boxed Universe here today. I know you must have a very busy schedule and it is very much appreciated. For those not acquainted with SPQRSoft, could you give us an introduction? I think you covered it pretty well up above. SPQR Soft is my company that I started in 2012 initially as a vehicle for me to publish iPhone and iPad apps. Your work has extensive connections to pen and paper roleplaying, are there any systems of which you are particularly fond? I really like more open ended systems. Lately for me that’s been Fate. I also really enjoy Savage Worlds and the the various Powered by the Apocalypse games. I really like Fate the most as it allows players to create exactly what they want for characters. As a player in other systems I often felt very pigeonholed into the archetypes that were provided. My first Table Top RPG was the West End Games D6 based Star Wars. I started playing that with my group of friends in Junior High in the early 90s. We slowly migrated into 2nd Edition D&D and the World of Darkness games that were around in those days. Do you enjoy RPGs in video game format, be they JRPG/WRPG/Action/Tactical etc? Yeah. I played Final Fantasy IV (II in those days) when it first came out on the SNES, and I was blown away by the game. I probably played it to completion several times. I played most of the Square games that came out in the mid 90’s. These days my preference is more for BioWare games. I haven’t gotten really into a Final Fantasy in years now. What led you to work on the iStore? I used to be the tech guy at the school I work at. For a while there we gave an iPad to every student, and my life pretty much revolved around setting up and repairing iPads. I decided to just try programming apps for apple devices just because it made sense as a platform since they were everywhere in my life. I hadn’t done a lot of programming in a few years, and I really enjoyed making apps. My wife encouraged me to start a business developing apps on the side. How did the idea for Dungeon Marauders come about? I was trying to think of a game that people could play on their phones while in lines at conventions. Something similar to Nintendo Streetpass, but for phones. The real idea of using the cards for hero abilities and dungeons came to me some morning after having too much coffee. I was heading to a game designer conference the next week called Metatopia, so I threw together some physical cards and took them with for playtesting. I convinced a group of people there to try it and the feedback I got from them told me that I had a solid game on my hands. The game uses some fantastic artwork, who illustrated the cards? I have 5 artists total. 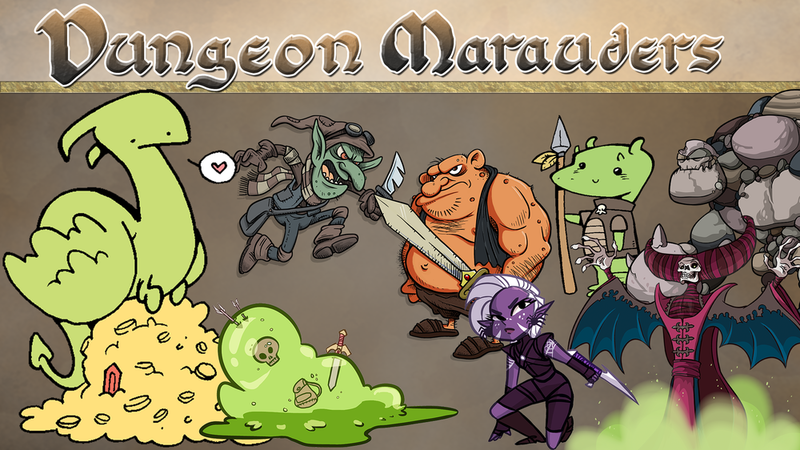 James Stowe, Jim Romer, Kaitlynn Peavler, Katie Cook, and Crystal Kan.
What were your goals with Dungeon Marauders? I was really hoping to make a game that people would play in near each other and at conventions. I didn’t really have any set goals for sales or numbers. The game features local multiplayer based on dungeon sharing through scanning icons and group boss encounters specific to locations. Can you explain for us how these boss encounters work? So, I can create a boss using GPS coordinates. Anyone who is near the coordinates will see the boss icon appear on their menu. The boss’s hit points are perpetual, so if enough people attack it, eventually someone will kill it. Everyone who participates in attacking it get a special item and some gold for helping. The game really doesn’t have a large enough player base for this to really work. Which came first, the concept of a dungeon crawl or the concept of making your own dungeon from cards and sharing it with others? The two parts were really hand in hand. I always wanted it to work so that you would have a dungeon and that you would go through other people’s dungeons. The game received support up to 2014 but hasn’t been updated since, would you consider it finished? Would you like to go back in the future and revamp/relaunch it? There are things I would love to do with it to make it a better game. I honestly don’t really have the time, and it doesn’t really financially make sense to put more time or work into it. Dungeon Marauders features no distinct world setting or story line, are those things that were cut or were they never intended to be there in the first place? They were never really intended to be there in the first place. How long did Dungeon Marauders take to develop? Well, I had the original card prototype in early november of 2013, and I released it in April of 2014. I didn’t have a day job at the time, but I did some other contract work. I would say that it probably took 3 months of solid work. What would you say the biggest challenge creating the game was? Definitely the marketing. I never had trouble actually designing the game, but getting a game to really take off is very difficult. Do you have a personal favourite card? I’m pretty partial to the kobold. It was drawn by Katie Cook, and I’ve been a big fan of her work for quite a few years. I was really excited when she agreed to do the work. What have downloads been like for the title since launch? Total I’ve had about 12,000 downloads. That’s dwindled as time has gone on of course, but I do see a couple hundred downlods each month. Most days I have anywhere from 30-50 people play the game. What are SPQR Soft’s plans for the future? At the moment, I don’t have a lot of specific plans. My day job teaching is keeping me pretty busy right now so I don’t have a lot of plans for SPQR Soft. Do you have any advice for would-be game devs? I would say do it because you love it. There are very few indie devs that can afford to do it as a day job, so it has to be something that you’re willing to sacrifice your free time to do. You need to be happy to make a game and just have it be out there, not something that’s going to make you a lot of money. If it does take off, and you can quit the day job, awesome. It’s fine to have that as a goal, but you need to make sure you aren’t horribly disappointed if that doesn’t happen. Thanks again for taking the time to answer our questions today. If any of our readers want to check out SPQR Soft for themselves the official website can be found HERE and Dungeon Marauders can be found on the iStore HERE.